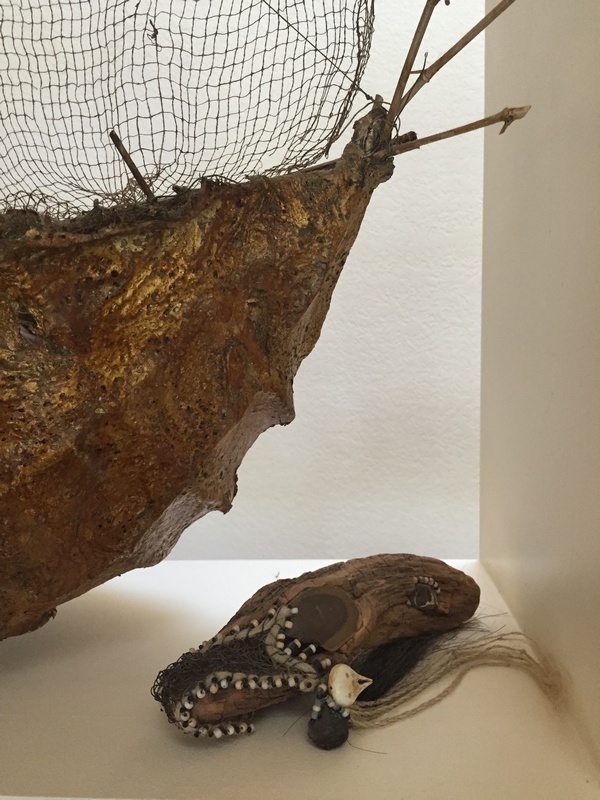 Now the natural materials and found objects are in total control of the form. 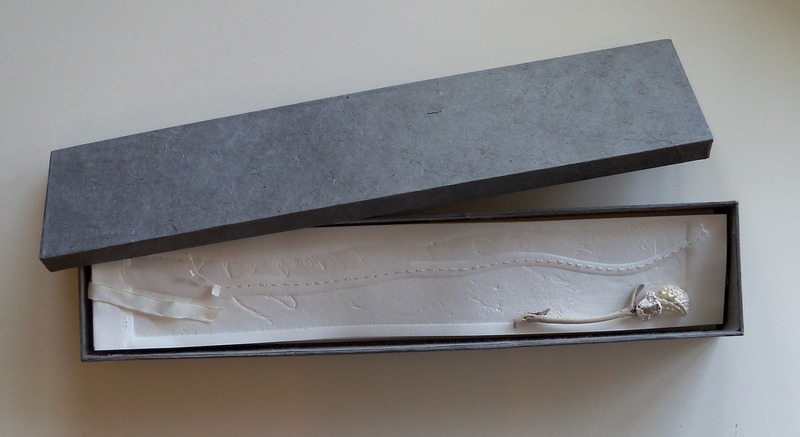 This was a small hollowed out piece of wood so I could still stay with the idea of containment. I was enrolled in Native American Ed Gray’s patinas in metals class, probably late 80s, early 90s. We turned our copper wire dark with liver of sulfur and hammered sheet copper and brass into bowl forms. We made castings and then of course we made things with the materials. I took this piece of wood, put some bits inside that would make a noise when rattled and did a knotless netting technique to close over the opening. Beads were added to the edges as I stitched into the wood where I had made holes. White horse hair also followed the outline of the opening. Then it was further adorned with more beads and embellishments. 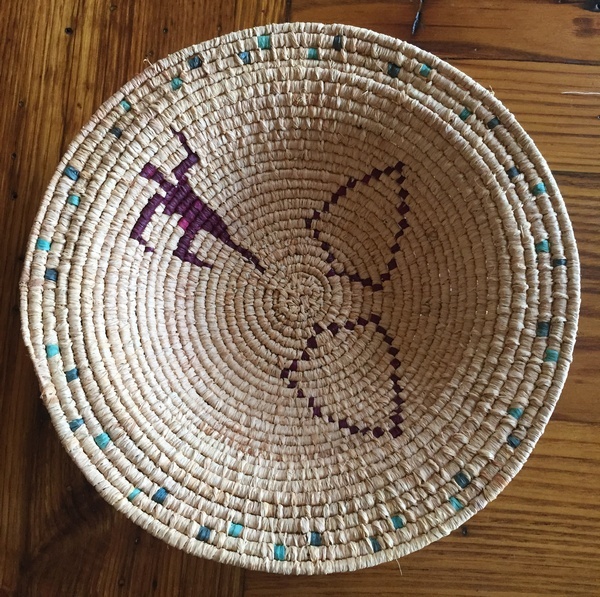 Back in those days all non-functional baskets needed to be adorned with beads and something flowing from it in an “artful” way. Which reminds me of when three of us making these “artful pieces”, went to show our work to a well known natural materials sculptor She advised one of us who wanted recognition (to be famous) by a certain age that she should get busy, another one of us was advised to make up her mind whether she was going to be making baskets or floral arrangements and because I had too much to take with me, I gave the poor woman a slide show. At the tedious end of it, her comment was, “Well, you are certainly diverse.” I don’t think any of the three of us were anything but totally happy that she let us into her home and looked at our work. Whatever she said likely fell on deaf ears. We came away pleased with ourselves which may or may not have been her intention. So back to the transition away from baskets. 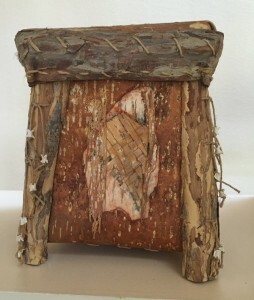 Below is a piece I made from birch bark, red pine bark and and the entire skeletal remains of a small snake given my by a elderly student at the John C Campbell Folk School when I first started teaching there in 1988. He was quite right in his assumption that I and my students would use anything to enhance our baskets. I titled this piece “Box for Brian Froud”. At the time he was the author and illustrator of a coffee table book on Faeries. And I thought he likely would not have kept all his notes and interviews in a leather briefcase, but more likely something like this. It was no easy feat for me at the time to actually have a lid fit onto its base basket. After moving to the South in 1992 I found an endless supply of honeysuckle to work with. Combined with my husbands castoffs from his wood turning I started working on purely sculptural pieces. Sometimes the barks were used and on others the vines I had access to. 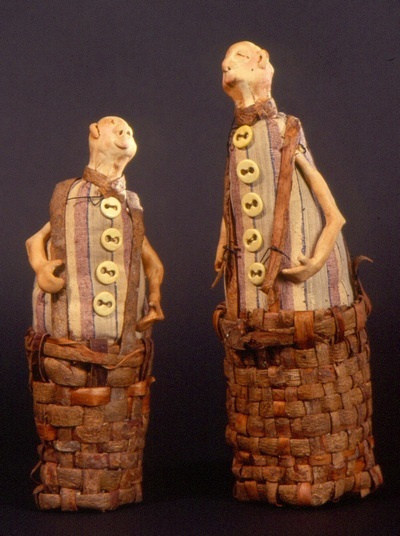 I also used the bark to weave likenesses of the men I met here in town at the local store. Five years later those same men would become the focus of my art studies for my MFA at Vermont College. But here is one of my first impressions. Porcelain clay faces and arms, fabric and old underwear buttons were used with the bark. And after I did this pair I went on to separate the lower area into two legs so I could shape them into stepping and dancing as the group increased to three. There was only these two sets made, not because I lost interest in the men but because I was likely running out of the bark that came from fallen trees in the storms at the time. I was working on my Bachelor of Fine Arts at Western Carolina University and found other ways to turn some of the men I have known into subjects for interesting art….more of social commentaries on their present circumstances. There were more than just a few men I had met that just up and left home for one reason or another, but all had something to do with a lack of being nourished in some way. So back to the outcast wood turned bowls. And back to an earlier study I had made of the origins of hobos in this country. I had corresponded with Steam Train Maury, a hobo of some renown who told me that once he left, there seemed to be no desire to return. They all seemed to be looking for something that just was not at home. Here is the bowl made that holds nothing along with a serving spoon that has a hole through it. 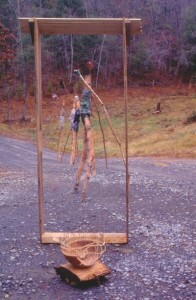 This was an installation made for undergraduate work. The empty bowl on one side of the threshold and five men leaving with their bindles walking away. I loved cutting down the trees, turning them trunks up and wrapping cloth around their body sections with rags and nails also used in the packs (bindles) carried over their shoulders. All done before we had digital cameras so copies from slides is all I have now…..and the memory of these men and their reasons for not being home. I used to make baskets and occasionally try placing patterns in them, patterns of my own choosing. This one was inspired by the beautiful Native American Baskets with coiled, intricate designs. My original thought was to have three evenly spaced dancers, but rushing right along (the coiling technique is like that….just one more round and I’ll stop and look) I pulled out the maroon colored raffia too early and was hence committed to do something else. So there ended up being one dancer and two shield like shapes. I was better at working out the turquoise bits near the rim. This is one of my favorite coiled pieces made in the early 80s. 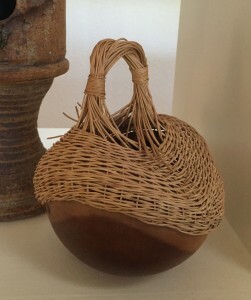 I started making baskets back in the mid 70s taking classes with Grace Kabel in Michigan. Several of her students went on to teach workshops. 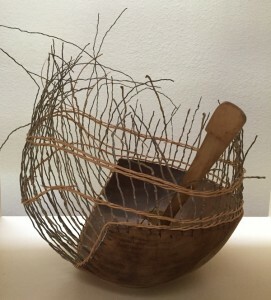 I must admit that I never really liked the prescribed products that were such a popular way of learning basketry techniques. I much preferred just handling the materials and seeing if they would fit some idea I had for a shape or purpose. 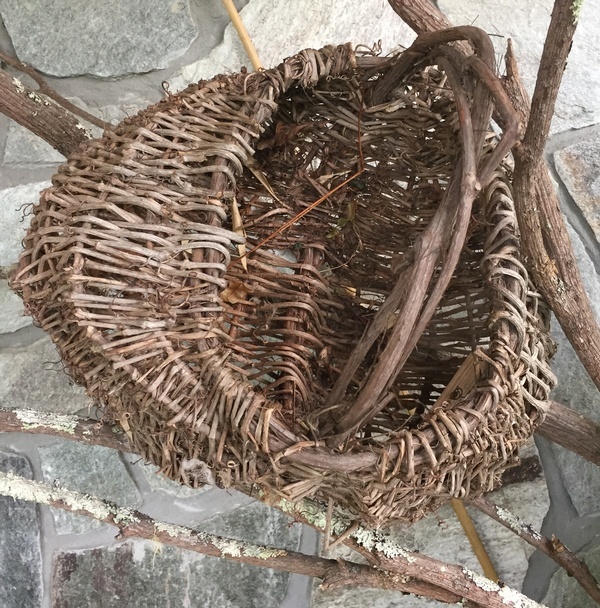 Below is my first rib constructed basket made from some vine I collected in the yard. I was so excited to have done it back in 1978 that I couldn’t wait to show Grace. 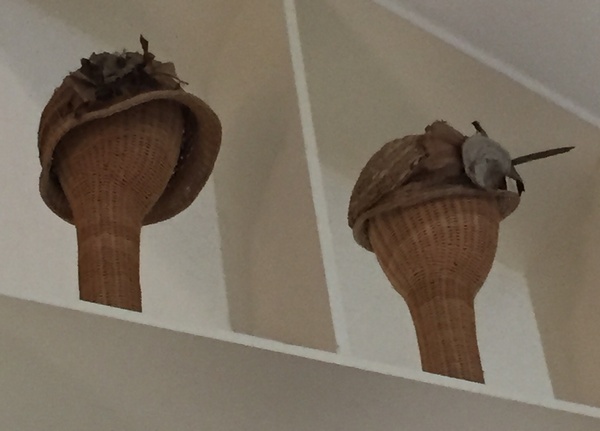 She was her usual kind and generous self and said something like, “That’s nice, Sandy.” But I could tell she was not quite so sure about its functionality, which back then was the sole purpose of baskets. At the time my fellow students were more concerned with making the seven muffin, not eight, not six, but seven muffin basket where one would fit perfectly amid a surrounding of six equally spaced muffins. I liked working with these naturally found materials and working them in with the processed rattan reed we were being taught with. Somehow it made the work different and “different” was important to me. In the 80s I was teaching the more adventuresome how to make hats. Here are the two I still have, covered with dust on the uppermost shelves in the living room. 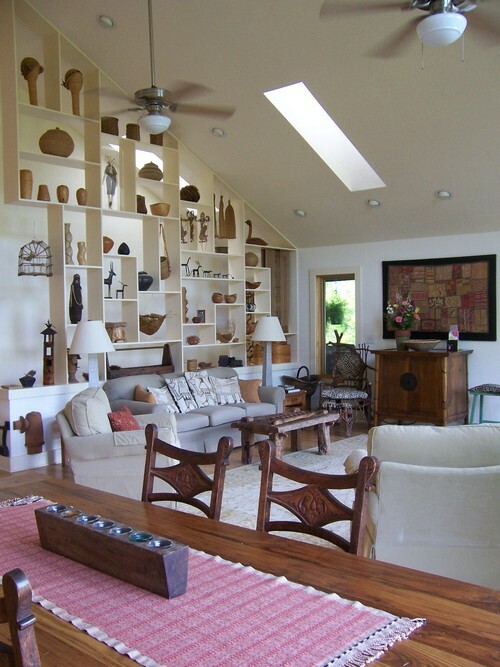 There are more things I used to do on these shelves and some are containers and or baskets and or sculptures, all made with found materials and parts that are more finished in appearance. I will save them til next time. 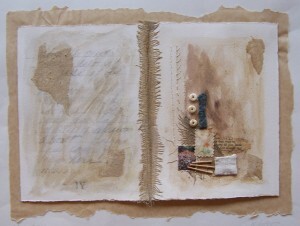 It is fun to look at my own history in art and crafts this way and strange how I seem reluctant to let some of them go. 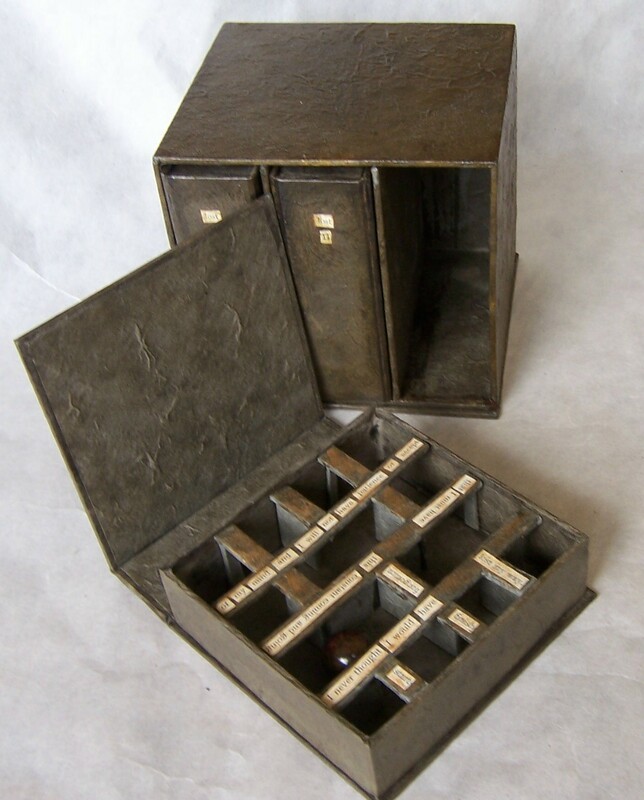 I was asked by a book arts instructor to bring some of my work that related to the idea of containment in books and boxes and talk to her students about it. This morning I took a full case of assorted pieces that sort of related to the topic and tried to keep myself to the allotted forty-five minutes. It was hard to do because each piece has its story and way of being manipulated and viewed individually. Like this piece above about the fragility of our land…Prayers for the Earth. 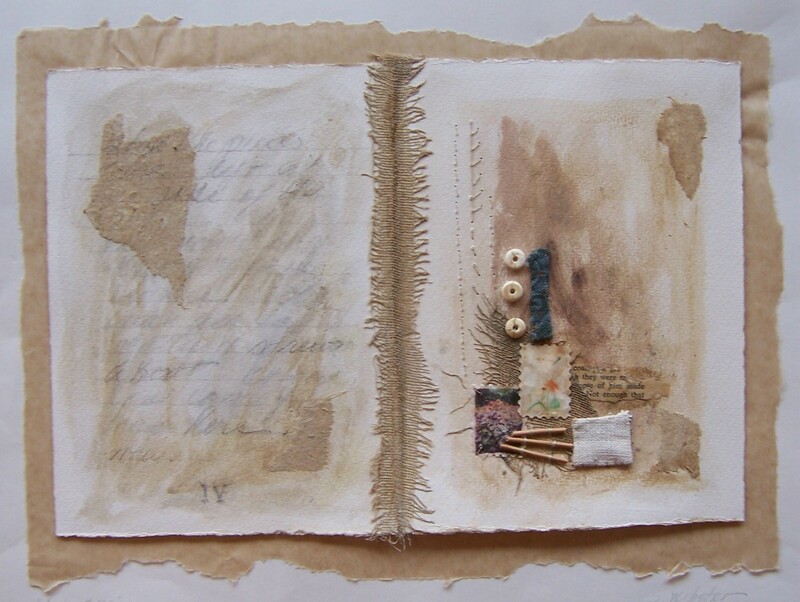 Collagraphed long pages with added objects and hand stitching. There were several questions about the imagery and objects and format. Sometimes you simply have to say, “I picked what I thought was appropriate and put it together…and I really love how it looks.” What else is there to say. I talked about this one. 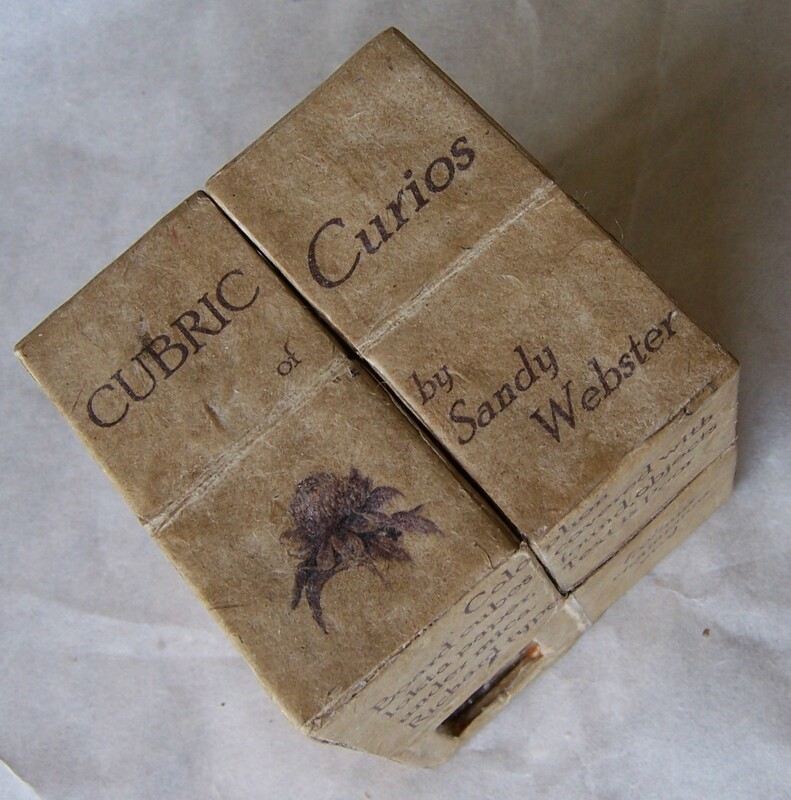 The shear joy of flipping it open in sequence, reading the text and peering into the mica covered windows at small curiosities. And this one. 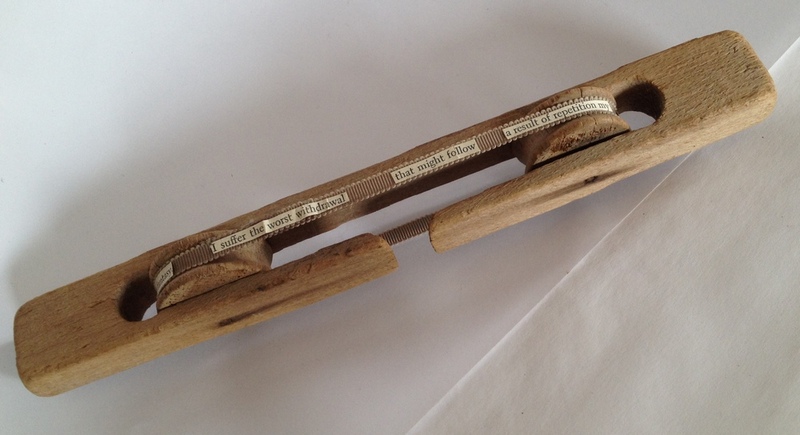 A scroll book in a box that maps out a daily walk and measures twelve feet in length. Each stitch in the hand sewn line being the equivalent of ten steps. 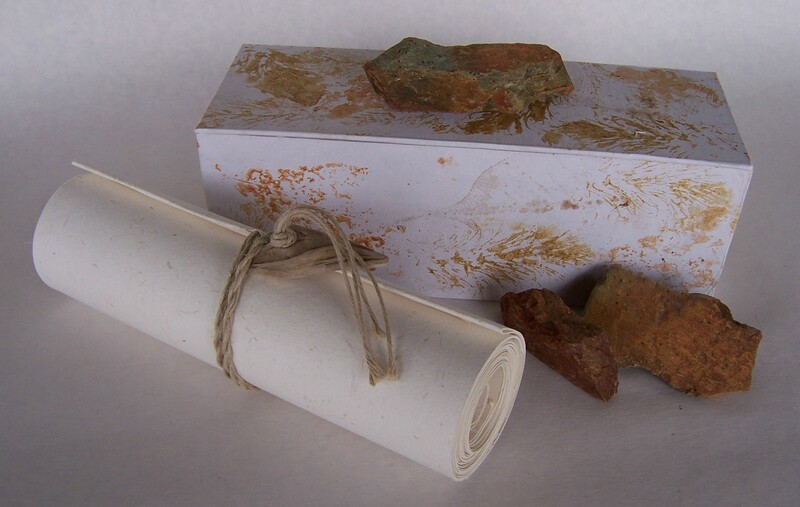 It is housed in a box marked by the soils and objects picked up along the way and full of small watercolors of what I saw along the walk. I showed them sketchbooks and we talked about calligraphy. They asked what I thought about calligraphy and I was honest. I don’t much care for the practiced craft of calligraphy. The text becomes too much about how it was put on the page and not what the message is. I told them that whenever I see calligraphy done as it usually is, I feel I have received an invitation to a wedding that I really do not want to go to. It is a personal reaction to all that labor of making letters. And I further said that when I do see the craftsman of calligraphy attempting to make it “artful”, it seems forced. 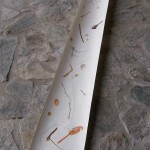 There are few that can move the marks of calligraphy past its own intention of looking lovely. And while I was at it, I added that I thought that too many calligraphers use other peoples writings and it would be good if they could simply come up a few of their own original words and not rely on those of others to make their work interesting. 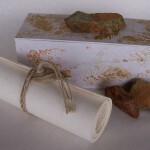 I didn’t show them this piece from a series called “Folios”. It is my own not so great writing on the left, fragments from journals. And on the right a visual interpretation of some of the message. And of course colored with natural pigments. I suppose for me the work I am looking at just needs to be interesting more than it needs to be correctly and laboriously done. And I showed them this. 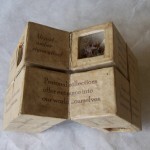 A series of three box/books using the text in fragments from an old romance novel to make out a sentence that the viewer can read by following the large marble clunk its way through the maze, bumping off walls toward the finish reading words in a sentence bemoaning “loss”. It doesn’t make much sense but it has the same “woefulness” of the maze books about loss. I took between fifteen and twenty books with me and left about twice that many home that related to their studies this week about containment. I enjoyed meeting the students and was most appreciative of their interest in my work. But best of all was telling the stories behind each piece and remembering why it was so important for me to make a book about it. This is the final image. 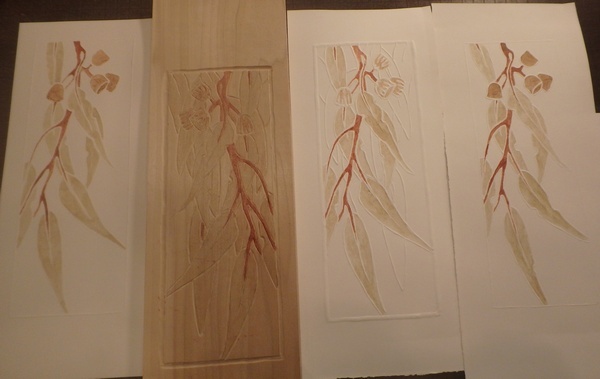 I looked at the one I printed with more colored leaves and kept going back to the first one I carved and printed. It had less leaves but more importantly it had the simple gum nuts. I tried lightening up the gum nuts that I had carved white spaces into and then only embossing the new leaves (note print on left). 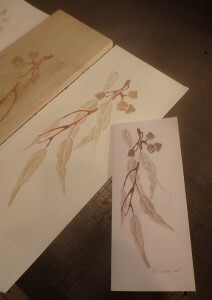 Then I just said to myself that maybe some of the leaves were just too cartoonish for lack of a better word. 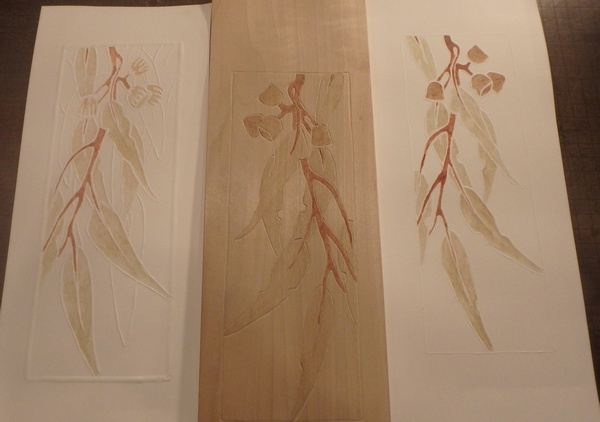 I turned the board over and in no time had a new block carved with corrections but still using my original drawing as a guide. Now I have the print on the right. Note that I decreased the embossing lines around the subject matter and the framing area. So now you can see the differences in the original print from the older carving and the transitions to the latest image. And because I liked the way it looked I decided to see if I could scan it into the computer and get the feel of the print by making several adjustments so that I could turn it into a card. Here it is. 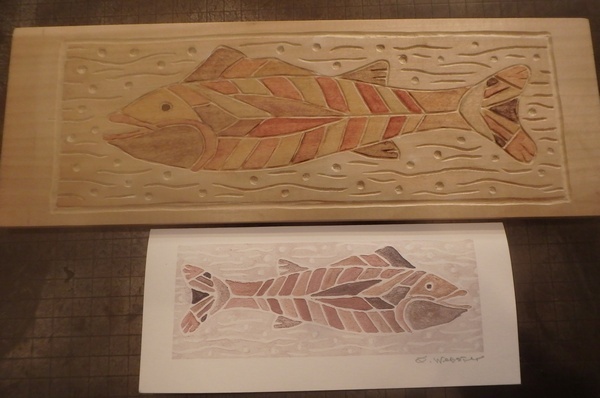 And liking how this looked I got out the Australian Land Fish print I carved and printed in Australia last spring using watercolors made from the soils there and came up with another card after scanning one of the prints I brought home.